News of an amazing and unexpected catch. On Saturday afternoon, a quick stroll along the canal with my other-half unexpectedly turned into one of the best (and most bizarre) angling experiences of my life. I knew catching was going to be tricky as the water clarity has taken a turn for the worse lately and given that it was late in the day, the water was going to be nicely churned up. So it wasn't with any seriousness that I picked up my ultralight set-up before leaving the house. It was a beautiful afternoon. We were happy just to be out and I was taking advantage with a few casts here and there. Adding to the lack of seriousness and due attention I had tied back on the same jighead I had used the week before, out in the boat. At 3 gram it looked heavy for the canal and on fishing, it was. It was impossible to keep my preferred slow retrieve, with the small paddle-tail I was using, without bumping the bottom and I was catching branches and other debris most casts. But again, I wasn't there for angling intentions. But then again, can any serious angler completely turn off? At a usual 'hotspot' I had a definite tap. With pure instinct alone I flicked my wrist and set the hook. "$#*%! Good fish!" The drag on the tiny 1000-sized spinning reel awoke almost instantly. Not dramatically, but in a controlled manner. This fish didn't know it was hooked to start with, and with just 2lb fluorocarbon mainline it was definitely in charge of the situation. The unseen fish took me on 'a walk'. While we strolled down the canal together, it gave me some time to contemplate what I'd hooked. Could a 5lb Perch feel this heavy and behave so casually? Would a Pike not have bitten me off by now? And what are those slow and heavy head-shakes? While I'd been completely focused on the fish, a couple of other lure anglers had appeared to my right. One of them - a local chap named Dave Harper - came over to offer support. From experience he listed the culprits from this stretch, but as I managed to turn the fish, finally, there was a magical moment. Almost in slow motion in my mind. A huge flash of gold and orange. Dave verbally arrived at the same conclusion as my brain did - "It's a carp!" Okay. This fish was special so it was time to keep calm, dig in and try to tire it out. On 2lb line it wasn't going to be a quick process. 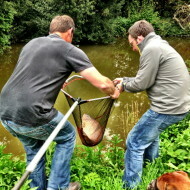 By a huge stroke of luck, Dave and his mate were Pike fishing and had a proper net. Slowly but surely, the capture started to feel more and more achievable. If I could just guide it to the surface for one pass we might be able to net it. Although I'd not met him before, Dave came across confident and capable, and I was starting to feel like this was possible. I can't recollect how much time had passed by the time we got out first attempt on the fish. I managed to steer the fish toward the bank and as it came out of the trench it had to surface. Dave stayed true with the net but as the crunch-time came the fish had too much strength and I had to let it bolt off against the drag. I counted my blessings that Dave had the experience not to hack at the fish. "Nice one Dave" I thought. A number of minutes later and we got another attempt. The fish felt slightly less lively. This was it! I'm not actually sure if I was still breathing when the fish slid into the outstretched net. "YES!" We'd done it! I was a wreck, but Dave recognised the importance of the fish (and its care), moving straight into weighing and photo mode. I gladly did as I was told. Wow, what a gorgeous fish I thought to myself. 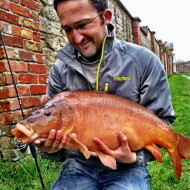 I'd never consciously seen a carp this colour. Even the shape looked unusual to me - the head was massive. Perhaps the differences of a canal caught carp, I briefly pondered. The Leather Carp went a touch over 22lb including the net. 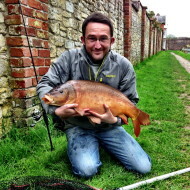 "It's a 20lb carp", said Dave. That'll do. We released the beautiful creature back into the murky canal, powering off in an instant. And there we have it. With much praise and thanks to a fellow angler, I'd managed to hook and land a 20lb carp on my ultralight set-up, 2lb line and a tiny, 2-inch soft plastic lure and jighead. It just goes to show that on occasion, every fish is a predator. I know it’s 12 months ago but that catch on that tackle is awesome! Well done. Many thanks David. It’s 12 months on but I haven’t forgotten the encounter. Definitely a fish of a lifetime!